A young Israeli couple will become the new emissaries to head the Mumbai Chabad House, bereft of its directors in a November 2008 terror attack. The Chabad-Lubavitch movement has announced that it is sending new permanent emissaries to head the Mumbai Chabad House in India. Rabbi Chanoch and Leiky Gechman, an Israeli couple with connections to the Jewish community of Mumbai, will soon arrive in the South Asian community. 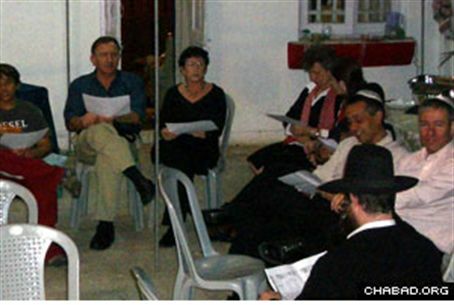 The site was bereft of its former directors, Rabbi Gavriel and Rivka Holtzberg in a brutal attack by radical Muslim terrorists in November 2008. Since that day, temporary emissaries have taken turns serving the Mumbai Jewish community. Rabbi Gechman was present at Mumbai's Nariman Chabad House to assist the Holtzbergs after the birth of their son Moishe, who was the only Jew to survive the massacre. His Indian nanny, Sandra Solomon, snatched the child and fled with him in her arms from the besieged building during the attack. More than 40 countries were represented at the Living Legacy conference hosted by American Friends of Lubavitch, where Kotlarsky thanked the Indian government for its efforts to facilitate the appointment.